KCHA/KCZE Station Manager Brandon Lewis (left), North Iowa News Director Kellan Heavican (right). Charles City, IA- North Iowa News was recognized Saturday night by the Iowa Broadcast News Association and the Midwest Broadcast Journalist Association for entries in the small market radio category, with three first place finishes out of the eight total awards received. At the IBNA Convention in Johnston, KCHA was honored with first place for In-Depth Series “50th Anniversary of Charles City Tornado Special Broadcast” and first place Feature “10th Anniversary of Cedar River Flood.” North Iowa News also received a second place finish for Best Use of Online Media with the “Stuff the Studio presented by State Bank” and honorable mention for its 2018 Election Coverage. Staff honored for their contributions included Kellan Heavican, Brandon Lewis, Chris Berg, Bob Svec and Kay Winkelman. “It’s a humbling experience and it’s a blessing to work with a set of people that value the principles and ideals of what small mart radio stands for,” said North Iowa News Director Kellan Heavican. Heavican is a 2018 graduate of the University of Nebraska-Lincoln. He started his work as the News/Sports Director at KCHA/KCZE in June of 2018. “These awards mean just as much to our station as it does for our communities because it’s about the stories we have the privilege of sharing,” added Heavican. Heavican was also elected to the IBNA Board of Directors on Saturday, representing Northeast Iowa. “I am extremely proud of our staff. 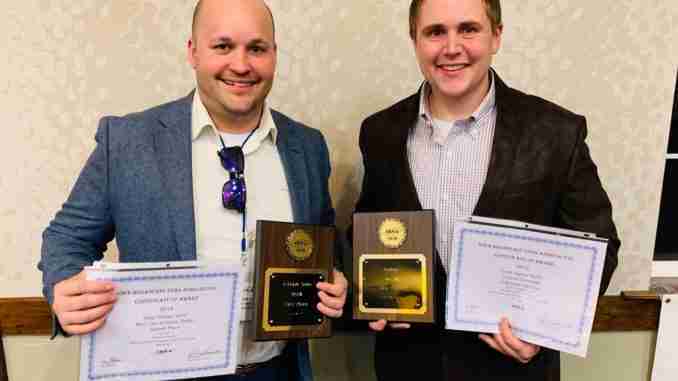 These awards just backup my feeling that we are the most credible and reliable news source in northern Iowa, something our listeners in Rockford, Charles City, New Hampton and the surrounding area deserve,” said Brandon Lewis, KCHA/KCZE Station Manager. “Also, thank you to our listeners for following and trusting our news, it’s why we do what we do,” added Lewis. The MBJA presents awards to the best work done by broadcast news operations and journalists working in small, medium and large markets in the six-state region on radio, television and online. North Iowa News can be heard Monday through Friday during three daily newscasts on KCHA AM 1580/ FM 103.3, KCHA FM 95.9 and KCZE 95.1 The Bull. News is also accessible by heading to KCHANews.com and 951thebull.com.